KP Performance Antennas has introduced a new BaiCells radio mounting bracket specially designed to quickly attach BaiCells' new ATOM GEN2 radios to the company's existing reflector dish antennas. The mounting bracket is designed to easily slot into their 23" and 27.5" reflector dish antennas while securely attaching the brand new BaiCells ATOM Gen2 radio. This rugged radio mount is made to withstand exposure to the elements and install quickly to save valuable time. In addition to the new BaiCells radio mounting bracket (sold as a single unit), KP has also introduced a product bundle that consists of 4 mounts and a 4-pack of either their standard 23" or large 27.5" reflector dish antennas. This provides customers a convenient way to purchase units in bulk when having to install CPEs at multiple locations in their network. The new mounting bracket is only designed to house a GEN2 BaiCells ATOM OD04-14 Outdoor UE 2 GHz or 3 GHz radio. Previous radio generations are not compatible. BaiCells is a high tech company providing disruptively-priced and technically innovative LTE wireless broadband access solutions, supporting fixed wireless, and mobile small cells. With the vision to connect the unconnected, it has introduced some real breakthrough technologies to LTE, like moving a complete LTE system to unlicensed spectrum and building it with IT based architecture. Its innovative solutions can be used by mobile operators, broadband access operators, cable operators, mobile virtual operators, governments and enterprise private networks. 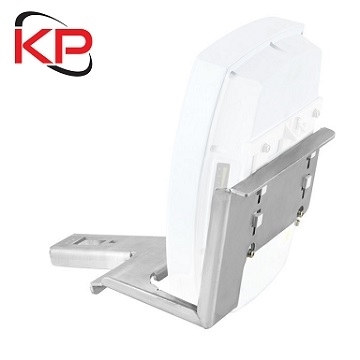 KP's new BaiCells radio mounting bracket and reflector dish antenna 4-pack combo are in-stock and can be ordered directly from KP's authorized distributors or on the KP Performance Antennas.